The kit shown comes with male and female insulators as shown at the lower photo on the front plate. These insulators are NOT the insulators that the element coil winds through. All hardware to install is included. This is a photo of an old strip heater. Courtesy of Norm Hill. 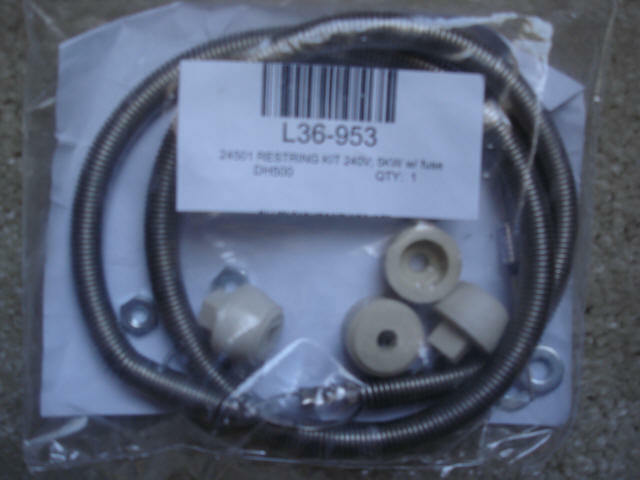 Our re string kits will simply "Re String" the burnt heating coil. 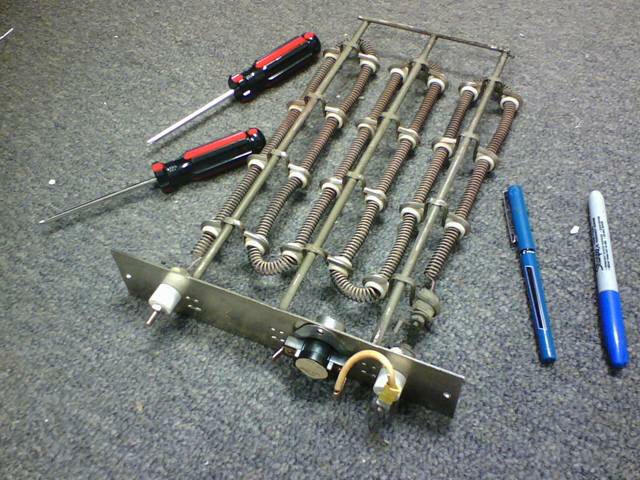 These kits can be used to repair burnt out heating elements in Electric Furnaces and Heat Pump Air Handler Heating Assemblies. Each element will produce between 2250 watts to 5000 watts @ 240 Volts, each, depending on which one is ordered. Example: if the K.W Rating of your Furnace or Air Handler with a total of (2) heating assemblies, producing 10.0 K.W. you would order (2) 5000 watt units if both of your elements need changing. ( 5000 watts=5.0 K.W. 3500 Watts=3.5 K.W. 3000 Watts=3.0 K.W.) Only qualified people should be installing these kits. The length table shows what the element will stretch to safely. Note: If you have burnt elements, it usually means you don't have enough air moving over the elements and they have gotten too hot. Check your filter and coil for cleanliness or increase blower motor speed to increase the air flow! For these reasons, and others, a qualified person needs to make these adjustments. NOTE: Photo is not the actual item, used for description only.